Lehmann, Peter S., Meldrum, Ryan C., and Mark A. Greenwald. In Press. Upward departures from structured recommendations in juvenile court dispositions: The intersection of race, ethnicity, and gender. Justice Quarterly. Abstract: Much prior research has examined racial and ethnic disparities in juvenile court interventions, and the evidence suggests that minority youth are sanctioned more harshly than similarly situated White youth. Additionally, scholars have explored the potential negative consequences of juvenile justice contact, and some research indicates that more intensive juvenile court dispositions are associated with increased reoffending, particularly among minority youth. What is unknown, however, is the relevance of race, ethnicity, and gender for these outcomes under a structured disposition guidelines system, which is intended to aid judges’ decision-making and reduce recidivism following justice system intervention. Analysis of youth sanctioned under Florida’s disposition matrix (N = 56,913) shows that Black youth are more likely to receive upward departures from the guideline-recommended sanctions and that the increased likelihood of recidivism resulting from receiving an upward departure is particularly pronounced among minority males. The implications of these findings are discussed. Meldrum, Ryan C., Jackson, Dylan B., Archer, Robert, and Candice Ammons-Blanfort. 2018. 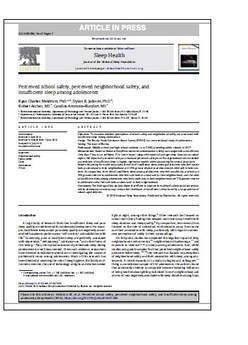 Perceived school safety, perceived neighborhood safety, and insufficient sleep among adolescents. Sleep Health, 4, 429-435. Abstract: Objectives: To examine whether perceptions of school safety and neighborhood safety are associated with insufficient sleep during adolescence. Design: The Florida Youth Substance Abuse Survey (FYSAS) is a cross-sectional study of adolescents. Setting: The state of Florida. Participants: Middle-school and high-school students (n = 7,958) attending public schools in 2017. Measurements: Based on National Sleep Foundation recommendations, sleep was categorized as insufficient (less than 7 hours) or sufficient (7 or more hours) using self-reports of average sleep duration on school nights. Self-reports of perceived safety at school and perceived safety in one's neighborhood were modeled as predictors of insufficient sleep in logistic regression models when accounting for several covariates. Results: Adjusting for model covariates, the odds of insufficient sleep among adolescents who feel unsafe both at school and in their neighborhood are 129% greater relative to adolescents who feel safe in both contexts. In comparison, the odds of insufficient sleep among adolescents who feel unsafe only at school are 39% greater relative to adolescents who feel safe both at school and in their neighborhood, and the odds of insufficient sleep among adolescents who feel unsafe only in their neighborhood are 71% greater relative to adolescents who feel safe both at school and in their neighborhood. Conclusions: The findings of this study indicate that efforts to improve the safety of salient social contexts in which adolescents develop may reduce the likelihood of insufficient sleep faced by a large portion of school-aged children. Bolger, Michelle A., Meldrum, Ryan C., and J.C. Barnes. 2018. "The contribution of maternal and paternal self-control to child and adolescent self-control: A latent class analysis of intergenerational transmission." Journal of Developmental and Life Course Criminology, 4, 251-275. Abstract: Purpose: Recent research provides evidence of intergenerational continuity in self-control. This body of research, however, can be advanced in several ways to enhance our understanding of this association. Methods: We add to this literature by examining whether maternal and paternal self-control, assessed during a child’s infancy, is associated with latent classes of child self-control based on assessments from eight waves of data spanning age 4 to age 15. Supplementary analyses were also performed using ordinary least squares regression to examine individual child self-control at each of the eight waves. Results: The results indicate that higher maternal and paternal self-control is associated with latent class membership characterizing higher child self-control. Moreover, maternal and paternal self-control were found to be equally consequential for differentiating between a low self-control relative to a moderate self-control class, whereas maternal self-control was a slightly stronger predictor than paternal self-control for differentiating a low self-control relative to a high self-control class. Supplementary OLS models revealed that both maternal and paternal self-control were statistically significant predictors of child self-control at 54 months of age and provided relatively equal contributions. But, as the child ages, the influence of paternal self-control appears to decrease as compared to maternal self-control. Conclusions: This study offers evidence that both maternal and paternal self-control are important for understanding the intergenerational continuity of self-control, but additional research with larger and more diverse samples is needed to better understand the relative importance of mothers and fathers for this continuity. Meldrum, Ryan C., Trucco, Elisa M., Cope, Lora M., Zucker, Robert A., and Mary M. Heitzeg. 2018. "Brain activity, low self-control, and delinquency: An fMRI study of at-risk adolescents." Journal of Criminal Justice, 56, 107-117. Abstract: Purpose: A vast literature finds that low self-control is associated with a myriad of antisocial behaviors. Consequently, increasing attention has focused on the causes of low self-control. While criminologists have devoted significant attention to studying its social causes, fewer studies have considered its neural bases. Methods: We add to this nascent body of research by using data collected on an at-risk sample of adolescents participating in the ongoing Michigan Longitudinal Study. We examine the functioning of prefrontal and limbic regions of the brain during failed inhibitory control, assessed using the go/no-go task and functional magnetic resonance imaging, in relation to low self-control and self-reported delinquency. Results: Results indicate that greater activation localized in the anterior cingulate cortex (ACC) during failed inhibitory control is negatively associated with low self-control. Moreover, the association between ACC activity and later delinquency is mediated through low self-control. Conclusions: Findings of this study demonstrate the utility of integrating neuroscientific and criminological perspectives on the causes of antisocial behavior. Concluding remarks address the theoretical and policy implications of the findings, as well as directions for future research. Meldrum, Ryan C., Piquero, Alex R., Ozkan, Turget, and Zachary A. Powell. 2018. "An examination of the criminological consequences and correlates of remorselessness during adolescence." Youth Violence and Juvenile Justice, 16, 279-298. Abstract: Warr recently proposed that remorselessness may offer a useful explanation for understanding persistence and desistence from criminal offending. While early empirical evidence supports this framework, not only is replication needed but there is also a need to consider potential determinants of remorselessness. Using data from the Study of Early Child Care and Youth Development, we examine the extent to which remorselessness relates to self-reported violence and aggression as well as several potential correlates of remorselessness. Our findings show that remorselessness during adolescence is associated with a higher likelihood of both self-reported violence and aggression even after controlling for self-control, peer violence, parenting, prior violence, and several other covariates. We also find that males and persons who associate with violent peers are more likely to evince higher remorselessness, while individuals exposed to higher quality parenting evince lower remorselessness. Implications of our findings are discussed. Boutwell, Brian B., Meldrum, Ryan C., Melissa A. Petkovsek. 2017. "General intelligence in friendship selection: A study of preadolescent best friend dyads." Intelligence, 64, 30-35. Abstract: Research on the topics of general intelligence and friendship formation separately has elicited a tremendous amount of attention across decades of psychological scholarship. To date, however, less effort has been aimed at uniting these lines of inquiry. In particular, do friendship bonds emerge, based in part, on shared levels of cognitive ability? Several disparate lines of evidence suggest this might be the case, however, a need remains to replicate this work using large national samples coupled with psychometrically sound measurement. The current study helps to fill this void in the literature using a national sample of American children. Our results reveal that preadolescent friendship dyads are robustly correlated on measures of general intelligence, and the effects withstand correction for potentially confounding variables. Meldrum, Ryan C., and J.C. Barnes. 2017. "Unstructured socializing with peers and delinquent behavior: A genetically informed analysis." Journal of Youth and Adolescence, 46, 1968-1981. Abstract: A large body of research finds that unstructured socializing with peers is positively associated with delinquency during adolescence. Yet, existing research has not ruled out the potential for confounding due to genetic factors and factors that can be traced to environments shared between siblings. To fill this void, the current study examines whether the association between unstructured socializing with peers and delinquent behavior remains when accounting for genetic factors, shared environmental influences, and a variety of non-shared environmental covariates. We do so by using data from the twin subsample of the National Longitudinal Study of Adolescent to Adult Health (n = 1200 at wave 1 and 1103 at wave 2; 51% male; mean age at wave 1 = 15.63). Results from both cross-sectional and lagged models indicate the association between unstructured socializing with peers and delinquent behavior remains when controlling for both genetic and environmental influences. Supplementary analyses examining the association under different specifications offer additional, albeit qualified, evidence supportive of this finding. The study concludes with a discussion highlighting the importance of limiting free time with friends in the absence of authority figures as a strategy for reducing delinquency during adolescence.